I want to try something like a recipe swap, sort of. At the end of each month, I will post a recipe that can be made almost anywhere in the world. Many of you are Expat Kitchen Experts (a.k.a EKE) and have invaluable culinary wisdom and recipes. The swap part comes from you sharing a favorite recipe with us. All you need to do is simply email me your recipe with your name. At the end of the month, I’ll post 1-2 recipes to share with everyone. You can email me at mdmaurer135(at)gmail(dot)com. I’ll start this month off with an easy to make recipe. This week we’ve experienced cooler weather because of a typhoon. 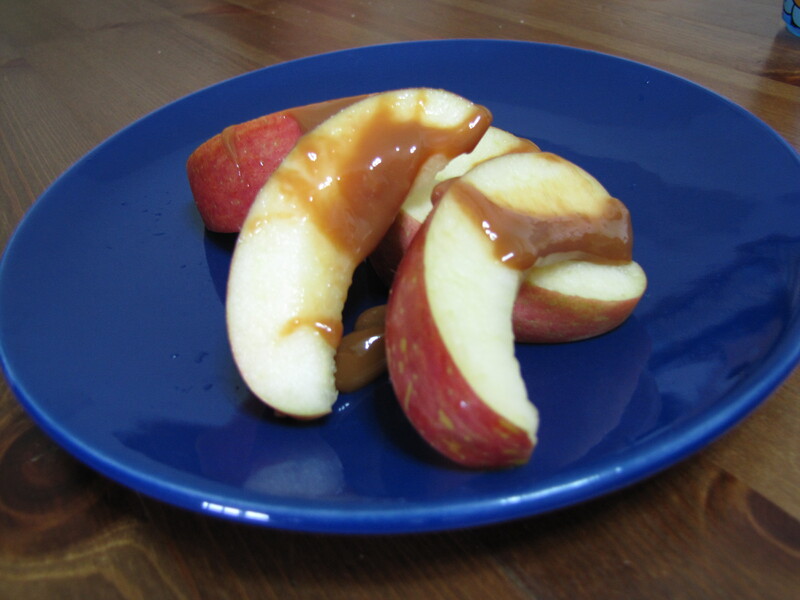 Since the kids had a typhoon day I felt like we needed some comfort food….Caramel Apples. Caramel candies are not easily available where we live, so here is how I make it. Place one can of sweetened condensed milk into a sauce pan and cover completely with water. Boil for 3-31/2 hours. Very Important: Water must always cover the can, so watch the water level and add as needed. At the end of the boiling time, carefully remove the can and let it cool for 10-15 minutes. Open and start dipping. After I opened our can I poured it into a bowl and the kids spooned it over their apples. This could be used on ice-cream or other desserts, as well. Remember to email me your recipes!